After monsoon hit Manipur this year, it rained without break for almost two days straight. Waters of the Imphal River overflowed in Imphal East near the Checkon area. The onrushing waters did not spare both the humble and the mighty, and for the first time since its inception in 1964, All India Radio went off air. The power supply got snapped and then the standby generator room got flooded. That was on 13 June. It took a good 12 hours before transmission could be restored from a makeshift studio at the Mayang Imphal Transmission Centre about 20 kilometres from the city. The flood waters also submerged part of the flyover at Uripok and citizens had to be evacuated using boats. The scene in the rural areas of Thoubal and Bishenpur districts were almost the same with numerous paddy fields and fish farms getting swamped and breaches occurring in many areas in the rivers. The Government of Manipur had to declare a three day-holiday for its employees and all educational establishments had to be closed down. It was a kind of emergency, which the state had not seen for years. But it is not that Manipur did not foresee it happening as discussions had begun in March. The government had initially thought that the encroachments along the river banks were forestalling the flow of water. Notifications were issued and dismantling of private structures along the river banks began in earnest. Then huge earth moving machines were deployed, which levelled the banks but not did not deepen or dredge them. But all such efforts came to naught as only two days of rain proved. 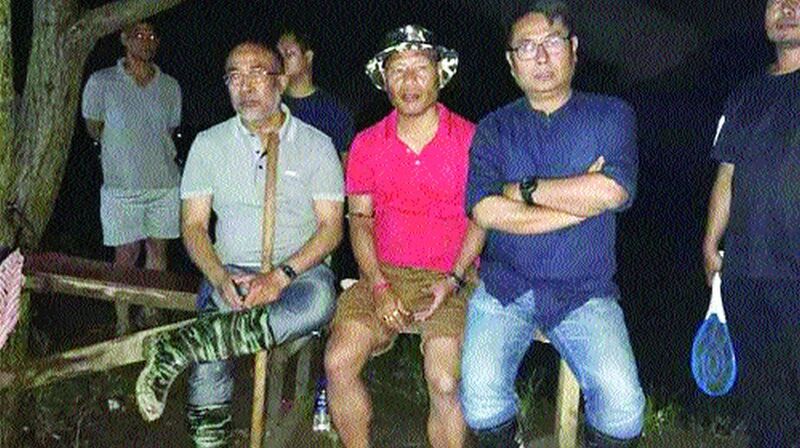 The state was quick to respond and chief minister N Biren Singh led from the front. Donning Wellington (gum) boots and accompanied by numerous officials including the chief secretary and DGP, he went around the breached sites to oversee relief and rescue operations. There were no helicopter surveys like former chief ministers but one of ground level interaction, which assuaged the feelings of victims. Soon relief camps were opened — 59 in number — and food and drinking water were rushed to the sites. From official records, more than 150,000 families were affected in 150 villages where 12,000 houses were damaged and five lives lost. While the state government has announced Rs 5 lakhs as ex gratia payment to the next of kin of the deceased, Rs 3.2 crores has been released to the deputy commissioners of each of the affected districts to tackle the calamity. Reportedly, neither has there been any request to the Centre to send in additional relief in terms of money/materials nor do they feel necessary to warrant a visit by one of the leaders to take stock of the situation. But what seems to be missing is a comprehensive flood plan to understand its roots causes and formulate remedies for immediate relief. It was in 1987 while doing a report for the Centre for Science and Environment, New Delhi, entitled “Manipur: Disruption of a fragile eco-system”, that I began a serious study on the flood situation. Manipur used to have a 10 year flood cycle, meaning a major flood used to occur every 10 years or so. Then this flood cycle started shortening, becoming a five year one and now it has become an annual phenomenon. So what I did was co-relate the deforestation rate with the flood cycle. It was found that while Manipur had only five licensed saw mills in 1970, the number had increased to 85 by 1980 and must have crossed 100 by now. One must be reminded that the massive flood that occurred in 1987, when waters even entered the Imphal Raj Bawan premises, was only after a four day spell of heavy rain. That basically meant that the catchment areas of the rivers of Manipur, having been heavily denuded, could not retain the water in the soil beneath the areas where once forests stood. The run-off was almost instantaneous along with heavy top soil erosion, which in turn made river beds shallower, thereby reducing its water carrying capacity further. The first serious rethinking on this was done in 1994, when Manipur was under President’s Rule and Lt General VK Nayar was the Governor. It was under his stewardship that volunteers of the Manipur Mountaineering and Trekking Association were entrusted to plant 167,000 saplings in the catchment area of the Singda River, which feeds the Singda Dam. The forest department was asked to provide the saplings but they almost ran dry after the third day. It was a sight to see forest officials crisscrossing the state in search of saplings, some of which had to be ferried in from Jiribam, some 200 kilometres from the plantation site! That made it amply clear that afforestation programs were mostly table exercises. The rejuvenation of forests in catchment areas has been paid scant regard till now by successive governments except for the Loktak Development Authority, which while tying up with the India-Canada Environment facility in 2000, had launched sustainable development and watershed management initiatives of the Loktak Lake. It had taken up a massive tree plantation drive in the catchment area of the rivers that fed the lake. That apart, the Imphal valley used to have numerous water bodies called “pats” or small lakes but demographic pressure has turned most of them into major office and residential complexes. Lamphel Pat, Porom Pat, Takyel Pat and Waithou Pat, to name a few, were all water bodies that would siphon off the excess flood waters during peak monsoon. Now, at long last, the government is thinking of creating a water body in the middle of Lamphel Pat to act as reservoir but there seems to be no urgency in pursuing the matter. And also, much of the flooding in the Imphal area can be termed as “drainage floods” that occur due to the lack of proper drains. The other bone of contention is the Ithai Barrage; managed and maintained by the National Hydro Electric Project Corporation, which runs the Loktak Hydro Electric Project (it produces 105MW of power). The Ithai Barrage is kept shut most of the time to maintain the water level of the Loktak Lake. Environmentalists have contended that all the barrage has been able to do is denude over 1,000 hectares of agricultural land. Once the barrage is opened, water from Loktak Lake will flow into the Manipur River, which joins the Chindwin in Myanmar. Another contention is that if the barrage is kept open, then the flood water in the valley would be eventually emptied into the Bay of Bengal. But there seems to be no effective joint management of the barrage between the NHPC officials and the Government of Manipur. It is only June and this flood should serve as a warning call since more will invariably follow. It would be prudent if N Biren Singh could gather all stakeholders including environmentalists, forest officials, and flood and irrigation engineers, among others, and come up with a comprehensive master plan. The same should to be submitted to New Delhi for funding instead of approaching them time and again as a fire-fighting measure.